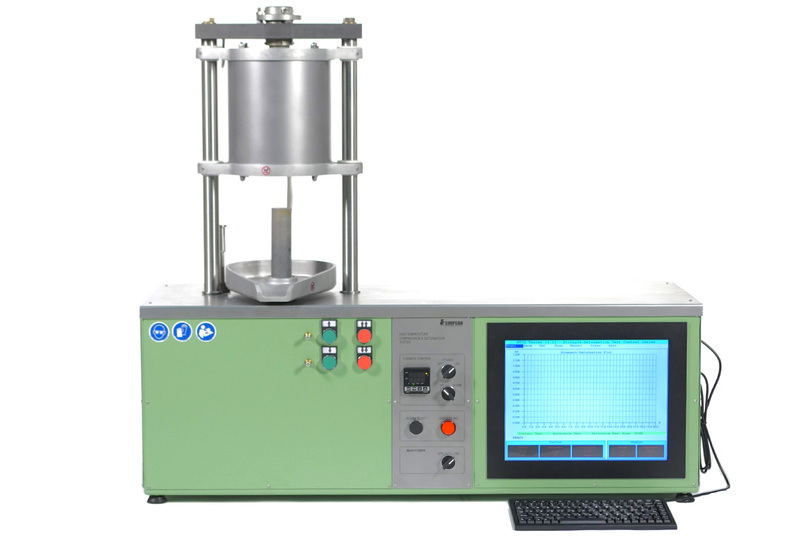 The High Temperature Compression Tester is used to determine hot properties of molded sand with any type of binder (kaolinites, bentonites and chemical binders). An electronic load cell and displacement sensor measures hot compressive strength, hot deformation, expansion, and restraining load at elevated temperatures. The test results are displayed on a color monitor, can be printed and can be stored into the memory of the instrument. When determining hot compression strength, the instrument generates and displays a complete stress-strain curve, and identifies the maximum compressive strength, deformation at maximum strength and maximum deformation. The display also indicates the real time strength and deformation of the sand specimen. An accurate digital controller and indicator regulate the furnace temperature. The furnace is capable of maintaining temperatures up to 2000o F (1093o C). An automatic timer controls the specimen heating time and activates the press at the end of the selected soak time. • Restraining Load Test – This test determines the force that must be applied to prevent the expansion of a specimen when heated to a chosen temperature. • Expansion Test – This test determines the expansion of a specimen when heated without any load (free expansion) or with a very small preload. The most common temperature applied is 982 degrees Celsius (1800 degrees Fahrenheit). This test will require continuous monitoring and adjustments of the lower pedestal. • Strength and Deformation Test – This test determines the load required to deform a specimen at a given temperature. The machine measures the actual values and the corresponding maximum strength. A curve is drawn and registered with all this data. The tester operates with both; the American Foundry Society standard specimens (1.125” (28.58mm) diameter X 2” (50.8mm) high) and the Metric standard specimens (11.28 mm diameter X 20 mm high).